Interpret the lead MCL-1 rhythm strip shown in Figure 1. Does this rhythm represent Mobitz I (Wenckebach) or Mobitz II AV block? 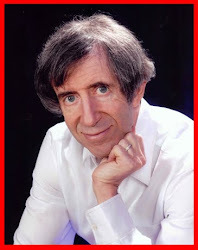 Is a pacemaker likely to be needed? Figure 1: Lead MCL-1 rhythm strip. Is this Mobitz I or Mobitz II? (Figure reproduced from Case J in ACLS: Practice Code Scenarios-2013-ePub). NOTE – Enlarge by clicking on Figures – Right-Click to open in a separate window. INTERPRETATION: Neither Mobitz I nor Mobitz II is present. Rather than AV block – the rhythm in Figure 1 is an insightful example of the “mischief” that blocked PACs (Premature Atrial Contractions) can cause, especially when PACs are frequent. Finding #1: A consistent underlying atrial rhythm (usually sinus) – which is established by similar morphology of P waves on the tracing. Occasional PACs or junctional beats may be seen – but constantly changing P wave morphology is much more suggestive of other phenomena (wandering pacemaker; sinus pauses or arrest; multifocal atrial tachycardia) than of “AV block”. Finding #2: A regular (or at least fairly regular) atrial rhythm should be seen when some form of AV block is present. Clearly – there may be underlying sinus arrhythmia. In addition – slight variation in regularity of the underlying sinus rhythm may be the result of the AV block itself (known as “ventriculophasic sinus arrhythmia”) – in which the P‑P interval tends to shorten for P waves that sandwich a QRS complex (thought to be due to transiently increased perfusion immediately following ventricular contraction). However, gross variation in the P‑P interval is usually not seen when the primary problem is AV block. Figure 2: Red arrows highlight each P wave in Figure 1. P wave morphology changes in Figure 1 (and in Figure 2). Sinus P waves are seen as a biphasic (small pointed positive followed by rounded negative) deflection preceding beats #1, 2, 3, 4, 5 and 6. In contrast – P waves buried within the ST-T wave of beats #1-thru-6 are triphasic (small negative-then positive-then narrow negative) deflections that clearly look different in morphology than the sinus P waves. These triphasic-deflection P waves arise from an atrial site other than the sinus node. Red arrows in Figure 2 make it obvious that the P-P interval varies. In fact there is a pattern to this P‑P variation (alternating short-long cycles) produced by the fact that every-other-P wave is early (premature). The underlying rhythm is atrial bigeminy (every other beat is a PAC). 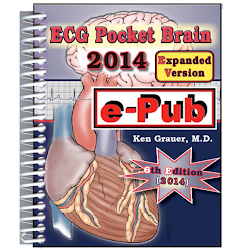 We introduced the concept of “blocked” PACs in ECG Blog #14. Depending at what point within the refractory period a premature beat occurs – a PAC may conduct: i) Normally; ii) With aberrant conduction (if part of the ventricular conduction system is still refractory); or iii) The PAC may occur so early as to fall within the absolute refractory period when no conduction is possible. This is what is occurring in Figure 2 – in which every-other-P-wave is blocked (non-conducted)! The commonest cause of a pause is a blocked PAC! Blocked PACs are far more common than any form of heart block. Although sometimes subtle – blocked PACs can be identified if looked for. Close inspection of T waves at the beginning of a relative pause will usually reveal a notch or other small deformity not evident in the T waves of normally conducted sinus beats. BEYOND-the-CORE: What is Happening with Beat #7? Unlike the PACs occurring within the T waves of beats #1-thru-5 (which are non-conducted) – the PAC that notches the T wave of beat #6 is conducted (ie, beat #7)! 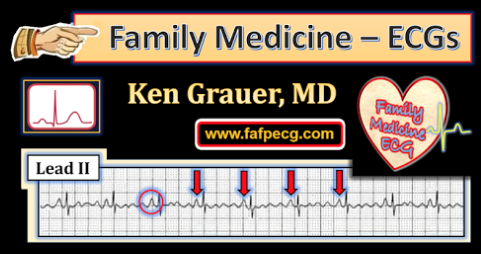 The reason for QRS widening and the different QRS morphology of beat #7 – is that this PAC conducts with LBBB (Left Bundle Branch Block) aberration. 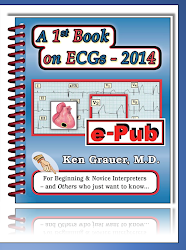 It presumably occurs during the RRP (Relative Refractory Period) – as illustrated in Figure 2 of ECG Blog #14. The reason for the longer-than-anticipated PR interval preceding beat #7 – is that the PAC that occurs within the T wave of beat #6 encounters a still partially refractory AV node, resulting in delay of conduction to the ventricles. BOTTOM LINE: The commonest cause of a pause is a blocked PAC. Remembering to think of this truism whenever you assess a tracing for possible AV block will prove invaluable in uncovering the real reason for the rhythm disturbance in a surprising number of cases. Blocked PACs occur far more often than any form of AV block. 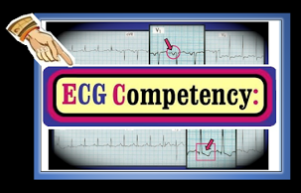 1) ECG Blogs on AV Block: Blog #19 – Blog #20 – Blog #21 – Blog #22. You are asked to interpret the ECG in Figure 1. You are told that the patient was just resuscitated from cardiac arrest. This is his post-resuscitation 12-lead ECG. In light of this history – How would you interpret this ECG? 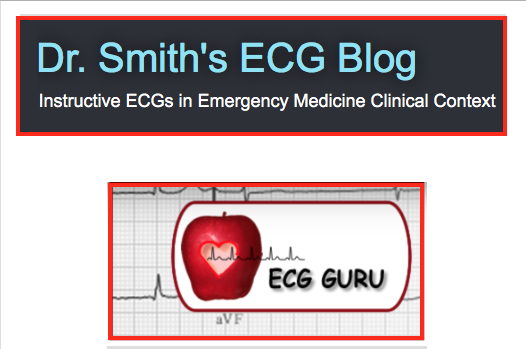 Given that the patient was just resuscitated – What treatment would you recommend? What would you expect to see on cath? Figure 1: 12-lead ECG obtained immediately post-resuscitation. What would you expect to find on cath? (Figure reproduced from Case C in ACLS: Practice Code Scenarios-2013). NOTE – Enlarge by clicking on Figures – Right-Click to open in a separate window. There is a narrow but deep Q wave in lead III – but no other Q waves. An rSr’ complex is seen in lead V1. Transition occurs early with a relatively tall R wave already by lead V2. ST segments show significant coved ST elevation in each inferior lead (II,III,aVF) – as well as in lateral precordial leads V5,V6. ST depression is seen in leads I, aVL and V2. Beyond-the-Core: There may be slight ST elevation in lead V1. There appears to be a peculiar downslope to the ST segment in lead V1 that blends into shallow T wave inversion in this lead. Acute inferior MI – is suggested by ST elevation in each of the inferior leads. ST segments have a “hyperacute” appearance – with broadening of the peak of the T wave in lead aVF; ST segment flattening in lead III – and straightening of the ascending limb of the ST segment in lead II. Taken together – this picture is highly suggestive of an acute inferior infarction. Support that the inferior MI is acute is forthcoming from the presence of reciprocal ST depression (seen best in leads I, aVL and V2 ). ST segment elevation in lead III is clearly more than in lead II. This finding is typically seen when there is proximal RCA occlusion. Support of proximal RCA occlusion is forthcoming from the marked ST depression seen in reciprocal lead aVL. 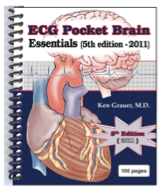 The RCA typically supplies the right ventricle – as well as the inferior and posterior walls of the left ventricle. As a result – one may see any combination of infero-, postero-, and/or right ventricular infarction when there is acute RCA occlusion. Clinically – one should always be on the “lookout” for evidence of RV (Right Ventricular) and posterior infarction whenever you see acute inferior ST elevation. Acute Posterior MI — is suggested in Figure 1 by: i) Early transition (producing sudden appearance of a predominant R wave by lead V2); ii) Positive “Mirror Test”, especially in lead V2 (See Figure 2); and iii) the findings noted in i) and ii) occurring in the setting of acute inferior infarction. Figure 2: Flipping the ECG in Figure 1 upside-down produces a mirror image of the electrocardiogram. 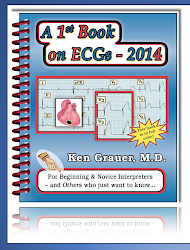 The anterior leads (V1,V2,V3) now provide an ECG picture of what is occurring in the “mirror-image” posterior wall. The positive “Mirror Test” is best seen in flipped-over lead V2 in this example – which now manifests a deep Q, ST elevation and T wave inversion suggestive of acute posterior MI (red arrows). Acute RV MI – may also be occurring. Definitive diagnosis of acute RV MI requires right-sided leads, which should show progressively increasing ST elevation as one moves across the right precordium (usually peaking by lead V3R to V4R). Lacking right-sided leads in this case – We can only surmise the possibility of acute associated RV infarction based on: i) the finding of acute infero-postero MI with likely acute RCA occlusion; and ii) subtle presence of ST elevation in lead V1 of Figure 1 – but not in V2,V3 (whereas with anterior MI from acute LAD [Left Anterior Descending] occlusion there is usually ST elevation in at least several anterior leads). Lateral Precordial ST Elevation – is also present in Figure 1. That is – there is subtle but real ST segment coving in both leads V4 and V5, with slight elevation of the J point in lead V5. The ST segment is more elevated in lead V6, and takes on a hyperacute appearance in this last lateral precordial lead. That said – it is not certain that ST elevation in V5,V6 represents acute “lateral” infarction – since this could also be a reciprocal change resulting from acute posterior infarction (lead V6 almost being situated anatomically opposite to anterior precordial leads). The finding of acute infero-postero-lateral MI should make one consider the less common (~10-15%) anatomic variant of a left-dominant circulation – in which the circumflex artery is larger-than-usual, and extends to supply the inferior and posterior walls of the left ventricle. The RCA is a relatively smaller vessel in patients with left-dominant circulation. However, despite awareness of this anatomic variant – We still suspect the “culprit artery” in this case to be a proximal RCA (rather than left circumflex) occlusion given: i) marked ST segment elevation in lead III > lead II; ii) significant reciprocal ST depression (rather than ST elevation) in lead aVL; and iii) suspected RV involvement (suggested by the finding of ST elevation in lead V1 but not in V2,V3 in the setting of incomplete RBBB). Beyond-the-Core: As noted in our Descriptive Analysis (above under Interpretation) – there is a peculiar downslope to the ST segment in lead V1 that blends into shallow T wave inversion in this lead. 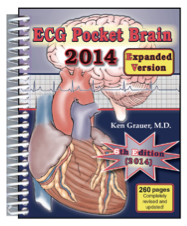 This appearance at least superficially resembles Brugada syndrome (See ECG Blog #50). Criteria for true Brugada syndrome are not met – because there is not at least 2mm of ST elevation with this downsloping ST segment shape in at least 2 anterior precordial leads. Nevertheless, since this patient is manifesting an acute STEMI and was just resuscitated – the ST-T wave appearance in lead V1 is at least worthy of follow-up (Click HERE for more on Brugada Syndrome). CONCLUSION: Unfortunately we do not have cath follow-up on this case – so our suspicion of acute RCA occlusion is unconfirmed as the “culprit artery”. That said, regardless of what the culprit artery might be – acute cath is indicated in this post-resuscitation patient who clearly manifests an acute STEMI that hopefully was treated with timely reperfusion.